The Praying Mantis is a symbol of cunning and power in Japanese culture and is consequently a highly respected theme in Samurai swords. 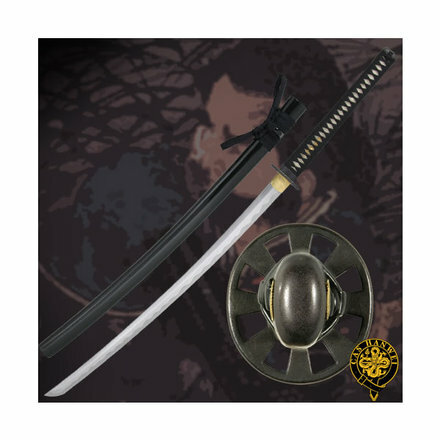 Built on our new L6/Bainite blade (detailed below) in the Shobu Zukuri style with Bo-Hi, and featuring superb koshirae, the Praying Mantis is a very desirable and functional piece. The subdued green silk ito and deep brown of the lacquered saya provide handsome contrast to the dark copper and golden accents of the tsuba, fuchi and kashira. The stalking mantis lies in wait for his next prey, mirroring the power and grace in this exceptional katana. Bainite is a structure of high-carbon steel that combines great strength with excellent flexibility and shock absorption characteristics. It has been known as an exemplary Katana blade component for a number of years but its use has been restricted to a few top-class master smiths, due to the difficulties involved in performing the exacting heat treatment procedures necessary for the production of a Bainite blade body in combination with the very hard Martensite Yakiba (edge section) required for Katana blades. Hanwei has now mastered this difficult process, using billets of L-6 tool steel (a very tough high-carbon low-alloy steel) as a starting point. Blades are forged and shaped in the normal way, then carefully heat treated to achieve the required Bainite and Martensite structures before final polishing. 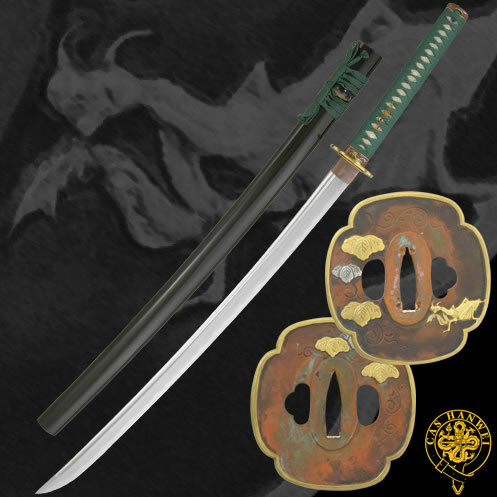 L6/Bainite Shobu Zukuri Blade Traditional Construction High Quality Koshirae Blade length: 29” Handle length: 11” Overall length: 41” Weight: 2lb 8oz Specs will vary slightly from piece to piece.